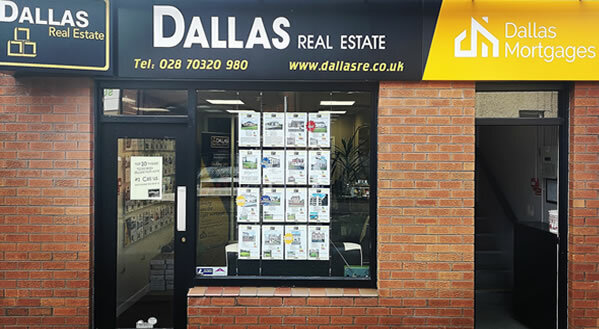 Dallas Real Estate is an independent estate agent located in Coleraine on the north coast of County Derry/Londonderry and Antrim, we specialise in the sale of houses, homes, land and building sites. 1 Granary Close, Coleraine - O/A 138,500. A beautiful three bedroom, semi-detached house on the outskirts of Coleraine. 31a Ballylintagh Road, Coleraine - O/O 230,000. Stunning four bedroom bungalow set on an elevated rural site on the edge of town. Established in 1993, Dallas Real Estate is an independent estate agency centrally located in Coleraine. With over 20 years of successful growth behind the firm, you will find a vast selection of properties on offer in a wide and varying range of locations, from the peace and serenity of coastal villages like Castlerock, to the hub and activity of Coleraine town. You can also view homes in the exquisite rural retreat of Aghadowey, to the stunning sea views in Portrush/ Portstewart and on round to Bushmills – the home of the world famous Old Bushmill’s Distillery and Giant’s Causeway. Dallas Real Estate is sure to cater for all your needs. As Coleraine’s leading independent estate agents, we offer a first class service to all our clients, both vendors and purchasers. Choosing a new home is never an easy decision, and at Dallas Real Estate we try to take the stress out of the process through various channels. First of all, our brochures are laid out with an extensive insight into each property we have on our books. It allows buyers to have an informed overlook at properties of interest to them, helping in the early stages of the moving process. For sellers, it means that your home is presented in the best possible manner to maximise the chance of a sale. Having first opened our doors in 1993, our continued success has been due to our guarantee of a professional and dedicated service to all our clients. A strong web presence, featuring on the main property websites i.e. Property Pal and Propertynews. We also believe that a good relationship between the estate agent and the client is crucial in estate agency as it gives a personal feel to the transaction.